You got the job, congratulations!! Now it is time for the first day. 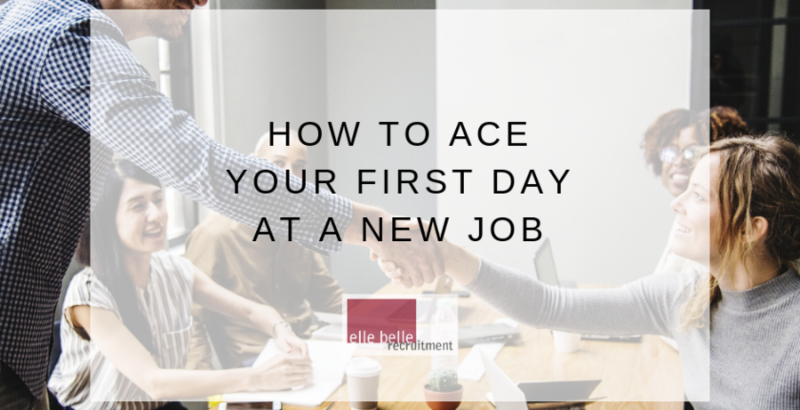 Below are some tips on how to ease the first day jitters and make the transition to your new home away from home a little easier. Dress the part: You may have gotten some direction in your employee contract on how to dress (neat business, corporate, etc…) but you won’t know until you have spent a few days at your new workplace what people actually wear. Stay conservative the first few days. Be sure to bring a suit jacket even if you don’t have it on. Guys, wear a button down shirt, and ladies, keep your hem lines on the longer side and avoid showing shoulders. Once you get a clear idea of what others in the office are wearing you can relax things to suit the environment. Be Confident: You may feel like the new kid on the first day of second grade but remember that you were hired for a reason. They saw something in you and feel you are the best fit for not only the job at hand but the company culture as well. Ask Questions: While it is important to come across as confident, it is just as important to be sure you are doing the right thing. If you come across something during the induction or training that you aren’t sure of, ask, then write notes. It is much easier to ask those questions in the first few weeks than to wait and have to admit that you have been doing it wrong for months. Create Healthy Habits: If you set expectations for yourself from the beginning it is much more likely that you will stick to those healthy habits in the long run. Pack a healthy lunch, take your lunch break and get some fresh air, set up your desk ergonomically. Listen: Sitting back and listening can give you a wealth of knowledge. If you keep your ear open you will become privy to any office politics, learn how decisions are made, and learn about any goals your boss has for the company. If all else fails, just smile and relax. You will settle in and be part of the furniture in no time.